Scotland’s First Minister, Nicola Sturgeon, has unveiled Virgin’s new ‘Flying Scotsman’ train, celebrating one of the most famous names in railway history. Virgin Trains, which runs a four-hour ‘Flying Scotsman’ express service from Edinburgh to London, has re-liveried a locomotive to promote rail travel to and from Scotland. This marks a major milestone in the ‘Virginising’ of its fleet of trains into a distinctive Virgin red, as it continues to attract more people to travel on its trains, particularly between the UK’s two capital cities. Today’s unveiling took place at Edinburgh Waverley station on the same day that Virgin Trains announced a £16m contract to refurbish engines for its High Speed Trains, which are serviced and maintained at its Edinburgh depot. Nicola Sturgeon, First Minister of Scotland, said: “For over 150 years the Flying Scotsman service has connected Edinburgh and London by the historic East Coast rail route. It is wonderful to see the name of the Flying Scotsman train kept alive on the route with a new, contemporary design. David Horne, Managing Director at Virgin Trains on the east coast route, said: “We are thrilled to continue the legendary name of the Flying Scotsman. “Flying Scotsman trains brought style to the railways for many years. Our new train is a design twist on the legendary Flying Scotsman, recreating the glamour of rail travel for the 21st century, using our distinctive Virgin brand and style. “The re-livery of our fleet in Virgin red is now almost complete, but we felt we just had to create a unique look to promote our Flying Scotsman and travel to and from Scotland. Virgin Trains will also launch a new service from Stirling to London on 14 December 2015, and from May 2016, four additional return services will be launched between Edinburgh and London. The company has signed a £16m deal with engine manufacturer MTU to refurbish all 35 diesel engines for its fleet of High Speed Trains. The engines will be fitted at its Craigentinny depot, in Edinburgh over the next two years. David Horne added: “This new engine replacement programme will ensure the continued strong performance of Virgin Trains’ High Speed Train fleet until the introduction of new Super Express Trains from 2018. From a Flying Scotsman to a Red Arrow. 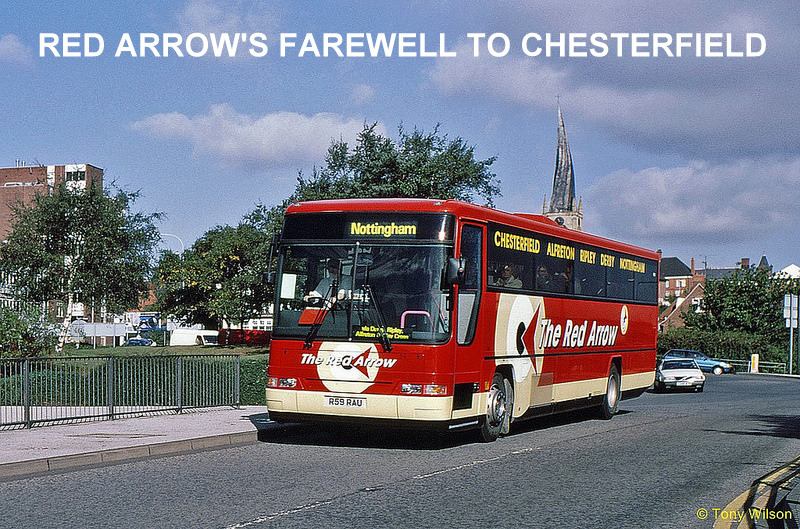 Recently the northern element of the Trent operated 'Red Arrow' service between Derby and Chesterfield came to an end. Replaced temporarily by yellow liveried low-floor buses, these will in due course turn black and be marketed as 'The Comet'.